Empowerment is the release of the full potential of every individual; it can make the difference between mere competence and excellence. Empowerment has the word power in it for a reason. To give power to others you need to let go of some of your power. But you don’t lose – you are collectively creating more power! 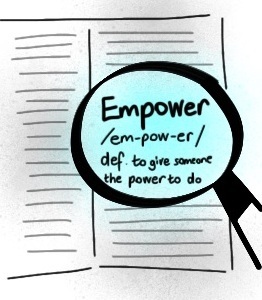 Do the people you lead feel empowered? Trust in people’s abilities and link work to their interests and aspirations. This DiA tips and hints guide provides more ‘warning signs’ to be mindful off, and a range of additional practical suggestions to increase empowerment in your team. Click here to access it.